Earlier, I discussed the relative unavailability of data regarding child predation and loosened sexual standards in Scouting. Today, I want to look at the policy change proposal from the perspective of principles rather than consequences. When an institution like the Boy Scouts of America is in decline, we tend to focus our attentions on membership and finances (not without good reason). Nevertheless, if Scouting is to be consistent with itself, rightness should take priority over efficiency, even though the two are not necessarily in conflict. Let us look at the ethical foundations for the BSA, shall we? Granted, as a religiously pluralistic organization, the Boy Scouts’ authoritative moral resources are sparser than those of a church or synagogue. Nevertheless, there is a morality, and it is more than a simple mutual assent and popular vote. First off, the BSA requires belief in God—it is not specified whether this be deistic or theistic, but it is generally understood to be monotheistic. An atheist cannot repeat the Scout Oath, even if he could respectfully acknowledge the sacred and thus be “reverent” as per the Scout Law. Second, Scouts inherently believe in a moral law (almost certainly emanating from the Divine). The outline and summary for these principles can again be found in the Scout Law as well as the Slogan. Previously, this moral law was undergirded by both social norms and common American religious institutions, especially churches and synagogues. Indeed, the American culture helped clarify questions regarding decency and rightness. 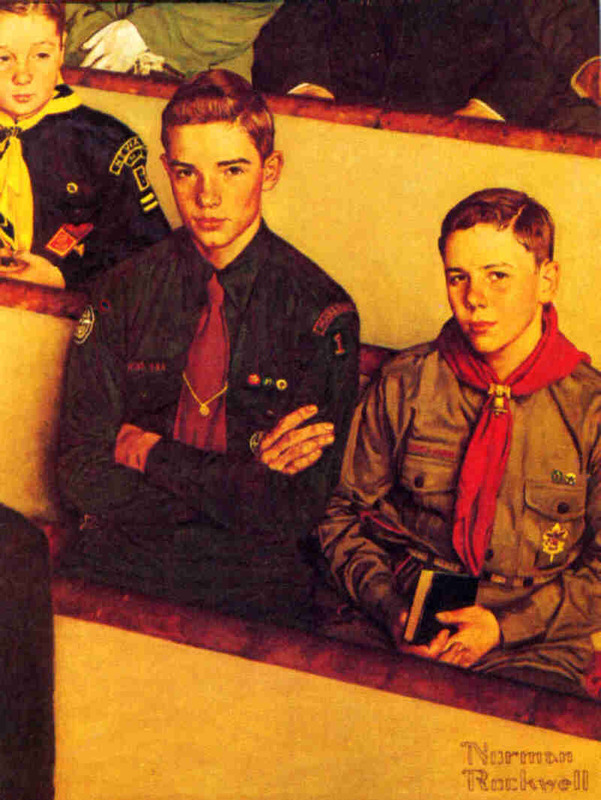 The BSA so assiduously embodied these moral norms that some use “boy scout” as a nickname for upright, responsible, and helpful people who do not compromise for the sake of convenience. Popular society has increasingly abandoned traditional morality. However, religious groups that invest in Scouting favor the principles of the Oath and Law. Which brings us to the point where deconstructionists and libertine spirits get upset: the Boy Scouts recognize homosexual activity as immoral according to their own principles. The majority of actual Scouters see homosexual behavior as contrary to the moral law that the BSA recognizes and which is further enforced by the undergirding religious affiliations of members and loyal supporters. The case is reminiscent of the broader natural law argument for marriage. This morality does not evolve according to majority vote; in its original intent and continued adherence, this morality is permanent (the more faith-oriented may even be willing to claim “eternal”). The Boy Scouts of America is not the final arbiter of moral reality; it simply recognizes that reality (regardless of whatever various routes they take to discover it). Now the sexually revolutionized American society is punishing the Boy Scouts of America. As Eric Teetsel recently observed, the typical member of the “Glee generation” may well be revolted by anyone sticking to their moral guns on issues of sexuality. The Scouts have already made significant sacrifices for their stance: they not only fought lengthy Supreme Court battles to protect their liberties. They are also giving up their historic Fort A. P. Hill location for their National Jamboree. In order to be left alone from further lawsuits, the Scouts will host their jamboree on privately-owned grounds in West Virginia. In light of these previous moral sacrifices, the cabal to change the membership policy becomes a betrayal. Two board members (James Turley, CEO of Ernst & Young, and Randall Stephenson, CEO of AT&T) announced they were ready to capitulate to corporate donor and activist demands. The governing board failed to come down decisively against the proposed changes. Instead, the leaders decided to wait on a final decision. Perhaps more traditional voices felt outnumbered and hoped that greater representation will eschew change and also grant more legitimacy to their claim. Nevertheless, it appears as if the controversy has been kicked down the road out of moral cowardice. Fingers point in the wind as money, influence, and political correctness flow through and from the American public. Although the upcoming vote may fall in favor of the current traditional policy, it seems as if another more important decision has been made by Boy Scout leadership. The CEO’s mentioned need to rethink their positions. They are attempting to apply practices from the business world to BSA. This is improper thinking because: (1) BSA is about children not adults; (2) BSA is a non-profit youth development organization; (3) The BSA program engages in team based activities requiring leadership responsibilities beyond most business requirements. I’m not surprised that CEO’s led the push for inclusion of HS in BSA. Corporate Boards and Executives are under tremendous pressure and external influence to promote “Diversity.” Diversity is a code name for programs to promote and celebrate historically repressed minorities and culturally diverse people. The LBGT folks have latched on to this appealing concept to include “LBGT lifestyle choices” under the “Diversity” umbrella. Discussion surrounding the legitimacy of including LBGT in the diversity efforts is not permitted. In the business world, diversity is the reality. And that includes LBGT folks and sympathizers. But that doesn’t mean LBGT folks have any special right to trumpet their political, moral and religious views in the workplace. And it certainly doesn’t mean they have the exclusive right to promote their political agendas outside the workplace by pressuring CEO’s to discriminate against “politically incorrect” groups and organizations. I think a friendly letter writing campaign to these CEO’s might help counter the LBGT pressure. Anyone have the address’s to which the letters should be sent?